C.W. Driver Companies has completed construction of Chapman University’s Keck Center for Science and Engineering in Orange. The 149.7k sf, state-of-the-art education and research facility is the largest, most expensive and most technologically advanced project in the university’s history. The center is home to the Schmid College of Science and Technology and Fowler School of Engineering, and includes an additional 145.6k sf of subterranean parking. The total cost of the center is $130 mil, $87 mil of which was completed by C.W. Driver Companies. The Keck Center is comprised of three floors and divided into two sections: the Hall of Science and the Hall of Technology and Engineering, bridged by a grand arch that serves as the focal point of the building. In total, the center includes 18 teaching labs, 22 research labs, 47 faculty and graduate student offices, three multi-purpose classrooms and six collaboration areas for students and faculty. The facility also features an 833-seat outdoor amphitheater/stadium and a 347-space, two-story subterranean parking garage. To enhance interdisciplinary work, the Keck Center features high-tech equipment and design elements such as writable glass walls within the science, technology and engineering labs. The Keck Center intends on serving more than 50,000 students during its first 20 years at Chapman University to allow students at all levels to pursue foundational sciences such as biology, chemistry, biochemistry, environmental science, mathematics, physics and more. C.W. 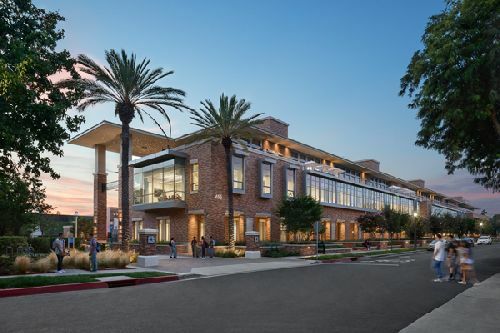 Driver Companies worked alongside Chapman University’s Campus Planning Department, AC Martin Partners, Inc. and Abacus Project Management Inc. on the project.